You, dear brothers and sisters, are called to follow the Lord with joy in this holy land! It is a gift and also a responsibility. Your presence here is extremely important; the whole Church is grateful to you and she sustains you by her prayers. “Nazareth” is associated with the mystery of the presence of Jesus, Mary and St Joseph in the little town of Galilee, from which “Love emerged to the whole world,” the mystery of which so captivated our Blessed Mother Foundress. 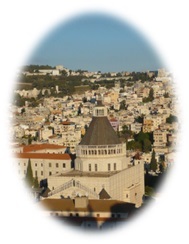 The idea of establishing a foundation in Nazareth was a heartfelt desire of the Sisters for some time. The Chronicles of the Generalate refer to several attempts made to establish a house in Nazareth, but the efforts did not bring the desired outcome until the time was right. 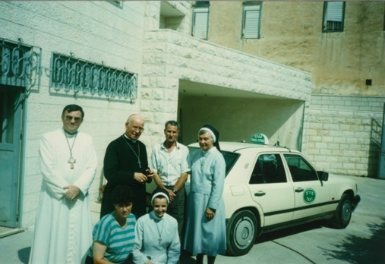 Through the efforts of the Prelate Krystian Gawron and the great kindness of Patriarch Michel Sabbah and the Bishop of Nazareth, J. E. Giaccinto Boulos Marcuzzo, our first home in Nazareth was established. This was the long awaited answer to the prayers and wishes of many generations of Sisters. The Superior General during those years was Mother Maria Teresa Jasionowicz. It was on August 20, 1994 that the first sisters: S. Rita Kathryn Sperka, S. Róża Pujsza and S. Wiesława Malesa, came to their new home. 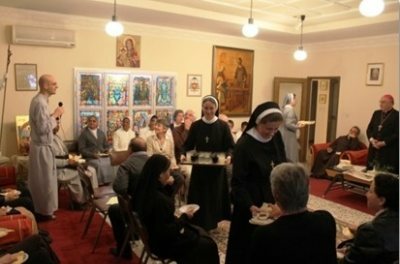 The Sisters’ ministry was to serve in the Latin Patriarchate in the Vicariate of Nazareth. It is not without significance that the first sisters came to this place of the original home of the Holy Family during the Year of the Family. The first three Sisters who were called to this mission, had to overcome many difficulties associated with living in a foreign culture, the inability to speak the languages and various other problems. Their great dedication, enthusiasm and courage in the face of these challenges were truly inspirational. Finding ourselves in the new reality of the Eastern culture, in a land rich with a variety of languages, living among people of the three great monotheistic religions: Christianity, Judaism and Islam, adaptation took some time. But it was and is a wonderful adventure, because, whatever the work, they kept strongly intact the original aim of their coming: “To remain by the spiritual source of their congregation, for the congregation and on behalf of the congregation”. As if they were in charge of drawing fresh water every day for renewing the Nazareth spirit of all the Sisters of the Congregation. The ministry of our sisters requires them to perform their normal daily duties, and somewhat repetitive tasks, quietly, patiently and with much flexibility. Looking from the outside, the work might seem monotonous, but nothing could be further from the truth. The sisters live a very dynamic lifestyle, behind which is a richness derived from the surrounding reality, discovering a little more each day of the Land of Jesus Christ. Because the sisters live close to the Basilica of the Annunciation, they often welcome passing pilgrims and guests, some among whom are our own Sisters. In addition to the ordinary everyday life of the Patriarchate, numerous guests and groups come to visit from around the world. The Sisters have an opportunity to meet and interact with these special guests. As a part of their responsibilities, the Sisters often accompany the Fr. Hanna Kildani, the current Apostolic Administrator in Nazareth, to different liturgical events. The Sisters are very involved in the life of the Church and take part in the celebrations of the local church in the Holy Land, of which they are a part – like “living stones” and witnesses to important events. Sisters have also made connections with many local families. They are present to the elderly and the sick, sharing in their joys and sorrows by visiting hospitals or going to the homes of the sick. Over these past 25 years, the life of the Sisters in Nazareth, has resembled the life of the Holy Family in its ordinariness and simplicity. Like Jesus, Mary and Joseph they live an ordinary life, and carry out their work in hiddenness and silence while being faithful to their prayer life. By participating in religious ceremonies, they remain united with the faithful and live each day aware of the problems of the Church in this land.